Flea and tick infestations in your New Jersey home, New York City business or backyard can threaten you, your guests and your pets. Get rid of fleas and ticks from your property for good. Call Horizon Pest Control at 1-888-824-7860 for a free consultation. Found all throughout the U.S., fleas are parasites that feed on the blood of the host, from dogs and cats to humans. They have pancake-shaped bodies and backward hairs on their legs that help them move through hair and grasp onto the host. Tan to reddish-brown in color, fleas reproduce rapidly, which can quickly lead to an infestation in your home, business or yard. Though rare, the bubonic plague can be transmitted by fleas. These pests can also transmit murine typhus, a bacterial disease that can cause a fever, body aches, nausea, vomiting, stomach pain and rashes. When left untreated, it can also cause damage to the vital organs. Flea bites are also a concern, as some pets and humans may be allergic to their saliva. Like fleas, ticks are parasitic, as they feed on the blood of animals. While there are many tick species, they’re often grayish-white, brown, black, reddish-brown or yellowish in color. As arachnids, adult ticks have eight legs. They’re also small, flat and ovular – that is until they’ve eaten. These blood-sucking bugs usually inhabit wooded or brushy areas and won’t come inside unless they’ve dropped off their host in order to lay eggs. When ticks bite, the site will usually become red, raised and itchy. In some pets and animals, an allergic reaction may occur. 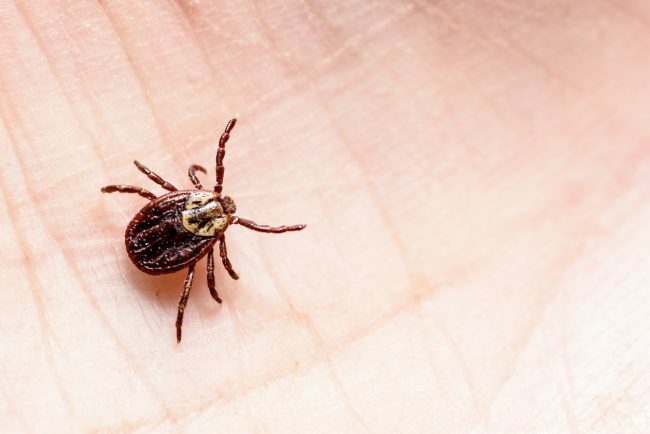 Ticks are also carriers of disease, the symptoms of which may develop in the days or weeks following a tick bite. Some diseases transmitted by ticks are Lyme disease, ehrlichiosis and tularemia. Bid farewell to pesky fleas and ticks with help from a trusted flea exterminator who can also provide tick extermination. Contact Horizon to receive a free quote, and put an end to the flea and tick infestation in your home or business once and for all.